A keyboard gathers dust beside my desk. I often wonder whether it feels lonesome, wishing someone would flip the power button and begin pounding on the keys. Eighty years ago I sat in front of an upright piano and began leaning how to play the C scale, eventually with both hands together. My father trained as a concert violist. My mother played the piano. They never voiced how they expected me to fit into the trio, but it certainly wasn’t as a pianist. I learned enough piano to accompany my father by playing chords, but my focus settled on the sousaphone because no one else was playing it in the high school band. I continued to play during college, but you don’t lug a horn that big around with you after graduation. “A blog is a hungry beast,” a friend wrote shortly after I began posting essays on this blog site two years ago. I have fed the beast more than 100 Fridays during that time and plan to continue doing so until I run out of words. My interest in promoting the sale of several books that I wrote late in my career served as the primary incentive for creating this blog site. I also wanted to showcase photography because that has been an important part of my vocation and now avocation. So, I hired a professional designer to create this blog site and to teach me how to operate it. Limit each blog entry to no more than 411 words, which matches the Twitter profile and appears to be the outer limit for retaining reader interest these days. Illustrate the blog with some form of artwork. I dipped into a treasure trove of illustrations once drawn for my use by the late Roy Paul Nelson, a journalism professor with whom I served on the faculty at the University of Oregon. I also use “free” clip art and occasionally use one of my photographs. Memoir may be the most popular topic that I discuss. Lifestyle issues run a close second. The Oct. 16, 2015, blog about my wife and I considering a move to an apartment drew the largest number of reader responses. I discovered recently that readers are tired of political comment. Lauren Kessler, a popular Eugene writer, is right about a blog being a hungry beast, especially if you post each Friday. Keep in mind, however, that I’ve been churning out words for more than 80 years. So, writing is what I do. It’s as natural as eating and sleeping. Topics tumble through my mind incessantly. Remember, too, that journalists are idea people, and I still consider myself a journalist. I often think of something to feed the hungry beast just before waking in the morning. A blog forms in my dream world, which prompts me to roll out of bed, walk to the computer and begin writing. Hemingway missed an important step in this process, however. You should brew a cup of coffee — or tea — before you begin typing. Annie casts a line on the North Fork the day before she returns to the University of Oregon as a sophomore on the next leg of her quest to visit and to photograph the world. The engine of a Piper cub sputters overhead as the plane nearly touches the towering Douglas firs. Moments later Annie hears a crash upriver, which sends her on a quest that will change her life. I write a thousand words a day fabricating Annie’s adventure until I hear from a friend who mentions a book about the process of writing fiction by Robert Olen Butler. 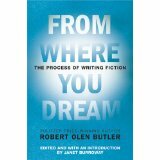 I decide that it might be helpful if I were to read “From Where You Dream,” which is based on several lectures and writing exercises that Butler shared with students at Florida State University. Big mistake. The first dozen pages interrupt my career as a fiction writer, and I’m uncertain whether I’ll live long enough to reverse the field and score with a best-seller. Would I choose journalism as a career if I were a young person preparing to enter college next fall? For openers, I’ve been called worse things, and I didn’t begin my career as a journalist 70 years ago seeking fame nor fortune. I soon learned that the most important responsibility of the press is to keep an eye on public affairs, especially on people associated with local, state and national governments.